When Lakeville South scores a goal, there are certain times when you don’t even need to wait for the announcement to hear who lit the lamp for the Cougars. You just know which player. 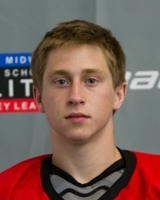 After all, Lakeville South senior Justin Kloos has been a scoring machine throughout his entire high school career, amassing 135 points (66 goals, 69 assists) in 48 games -- a 2.81 point per game average -- and that’s only his sophomore and junior year totals. This season, the future University of Minnesota Golden Gopher already has 46 points (20 goals, 26 assists) through 14 games. Kloos registered his second hat trick of the season and added an assist during his team’s 6-3 victory over Burnsville on Thursday, Jan. 19. Heading into the game against the Blaze, Lakeville South had lost three of its last six and Weber noted the rough patch was affecting the Cougars’ captain. With the high scoring win, it seems like Lakeville South is back on the right track. Weber agreed while also noting that he hopes the momentum gained from his team’s victory over a South Suburban Conference rival will carry over into their upcoming schedule. It almost goes without saying, but one person that definitely ‘did their thing’ was Kloos. And Kloos isn’t regretting a single minute of it. “It's been a really fun year,” Kloos said. “This is why I came back -- to be with my friends and have fun. We had a rough couple weeks but we're starting to get our step. We have a big week ahead of us. We got Eagan and Eden Prairie so we know we gotta bring our best game for them. While the high-profile and high-scoring tandem of Justin Kloos and Alex Harvey draw heavy attention from opposing defenses as well as fans, their other linemate, Patrick Lauderdale, is starting to show why he shouldn’t be left out of the spotlight. Lauderdale taught Burnsville that lesson early by jumping ahead on a blue line pass by the Blaze defense, setting himself up on a breakaway. The sophomore forward would slip the puck through the five hole to kick things off for Lakeville South just 34 seconds into the first period. Lauderdale finished the Thursday, Jan. 19, game against Burnsville with a season-high four points (two goals, two assists). Lakeville South coach Kurt Weber was pleased with how his young forward’s play has been coming along since the beginning of the season. Though it wasn’t an easy task settling into Lakeville South’s top line, Lauderdale knows he won the lottery when it comes to linemates. “It's unbelievable playing with (Justin) Kloos and (Alex) Harvey,” Lauderdale said. “They're just so good with the puck; they find space and I'm there most of the time. Weber knew it wouldn’t be easy for Lauderdale and empathizes with the sophomore’s stress of being on the Cougars’ often-spotlighted first line. “Sometimes you can feel like you're left out and even though (Lauderdale is) doing the right thing, he's not part of the play,” Weber said. "But last couple games we've sat down and talked with him and just mainly encouraged him as a sophomore -- you know you kinda feel sometimes with (Kloos and Harvey) on the ice you don't get much done -- but he's contributed. Now that he’s settled in, Lauderdale is getting more and more comfortable thanks to the help and support from his team -- especially when a linemate is one of the state’s top point scorers. As a former sophomore playing on varsity, senior forward Justin Kloos knows all too well what Lauderdale is going through, and Kloos has enjoyed seeing his linemate’s improvement. Lakeville South's Justin Kloos scored his second hat trick of the year to lead the Cougars to a 6-3 victory over Burnsville on Thursday, Jan. 19. Kloos also had an assist on one of Patrick Lauderdale's two goals. Lauderdale's first goal came just 34 seconds into the opening period as the sophomore forward scored on an unassisted breakaway. Launderdale added two assists to finish a season-high four point night. Alex Harvey also contributed three assists playing on a line with Kloos and Lauderdale. Cougars goaltender Hunter Ziniel finished with 33 saves to collect his eighth win of the year. Burnsville's Cory Chapman netted a pair of goals and Teemu Kivilhalme scored on a Blaze power play opportunity but it would come in a loss despite Burnsville outshooting Lakeville South. After replacing starting Blaze goaltender Dyllan Lubbesmeyer -- who made two saves on three shots -- eight minutes and 58 second into the first period, junior netminder Chris Mallon ended with 21 saves and was credited with the loss. Lakeville South (9-5-0) travels to South Suburban Conference-leading Eagan on Saturday, Jan. 21, for a 7:15 p.m. game at Eagan Civic Arena. Looking to bounce back from the loss, Burnsville (9-7-1) will host Rosemount at 5 p.m. on Saturday, Jan. 21, at Burnsville Ice Center. Scoring at least once in each of the three periods may be the most logical way to score a hat trick and Kloos is both smart and skilled enough to do so. Whenever Burnsville was fighting back into the game, Kloos was there to bury a goal which put a stopper on the Blaze momentum. Kloos also added an assist on one of Patrick Lauderdale's first period goals. On a line with two seniors (Justin Kloos and Alex Harvey), it may be easy to look past sophomore forward Lauderdale. As ESPN's Lee Corso would say, 'Not so fast my friends!' What was fast was how quickly Lauderdale scored as he snuck the puck through Burnsville starting goaltender Dyllan Lubbesmeyer's five hole just 34 seconds into the first period after an unassisted breakaway opportunity. Lauderdale finished with a season-high four points as he added another goal in the first period and collected two assists. Playing the role of the 'perfect lineman', Harvey had a trio of assists in the game -- two coming in the first period -- with all three going to one of his linemates. Harvey unselfishly set his teammates up in excellent position to make plays and was a force at both ends of the ice.